Just when you thought it was safe to go out in DC again. We're going to run out of places to boycott if these DC club owners don't get their acts together. In a post published to Facebook earlier today Rashad Ross says his trans friend Alesha wasn't allowed to enter popular Sunday Night hot spot Park at 14. During the week Park is a straight spot but on Sunday Night's club promoter Daryl Wilson takes over and the kids flock out in droves. According to his post, Ross and Alesha exited the club and when they attempted to re-enter club security gave them a hard time. The situation escalated to the point DC police were asked to intercept. Read Rashad's post below as well as his video below. The Manager (white shirt) came out and said she cannot come in based on a incident of discrimination a few weeks back where the Security Guards was mocking and Making remarks about her and She made a complaint. He continued to defend his decision even after she agreed to apologizes. The Security Guard then Says" EXCUSE ME SIR" Trying to be Disrespectful to her. We then askes to speak to the owner who came 30mins later. This Man (Dark Grey) shows up with a Very disrespectful Attitude and tell Alesha that Reason why she cant get in is because of a Facebook post that she made stating her dissatisfaction with the Clubs Security Disrespecting her. 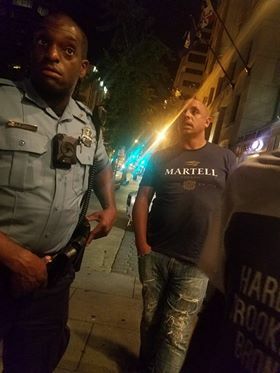 The owner then begins to argue with us to the point where i asked for DCPD to step in between because the OWNER became Agitated and Threatening. TS Madison Reads Caitlyn Jenner For Blood Over Trans Repeal "Don't Get Mad Now"